Vayu Mudra is useful to decrease air element within the body. This mudra is called as Vayu shaamak mudra because of its impact on Vayu element. This mudra is very easy to do, just placing your tip of the index finger on the base of thumb finger Vayu mudra is formed. 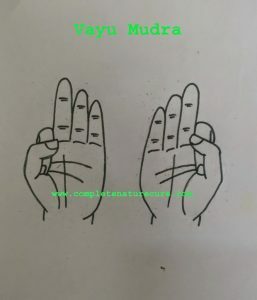 Here is the youtube link of how to do Vayu mudra and its benefits. 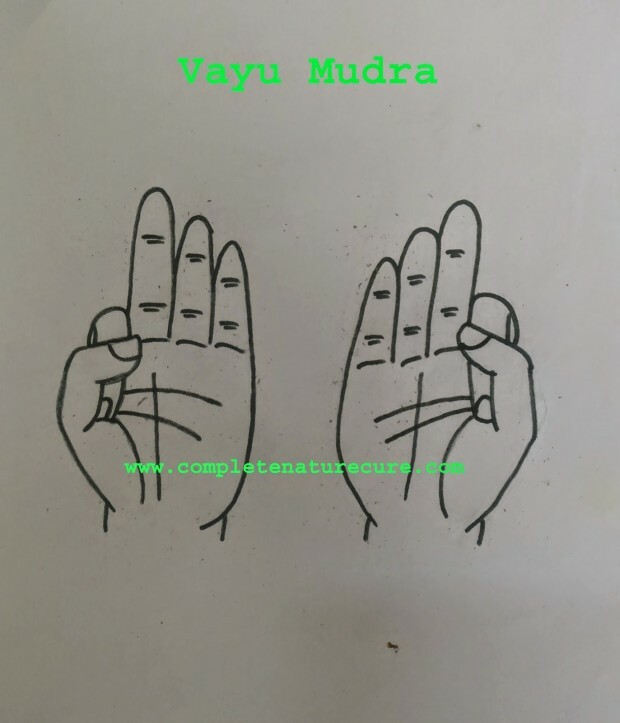 Vayu mudra decreases Vayu element within the body which enables various health benefits. 1.If your mind is anxious and restless Vayu mudra is the best remedy. 2. If you are over excited, then Vayu mudra will calm down your nervous system and you can feel relaxed. 3. Hormone imbalance of endocrine glands can be overcome through practicing Vayu mudra. 4. Other benefits of Vayu-shamak mudra are, Clears voice problems, allows rehydration of skin and articular cartilage. Vāyu is the important component of Vata Prakriti. Decreasing Vayu element in the body enables to overcome Vata dosha. If you are Vata Prakriti daily practicing of Vayu shaamak mudrā helps to live a disease free life. Daily practice of 30 to forty-five minutes is enough to get best results. You can do Vāyu mudrā any time or in any pose. It is recommended that early hours in the morning or while meditation to get quick results. Don’t do this mudra after you got the desired results.